Consider how many lives are affected by the work of one teacher, one doctor, one artist, scientist, engineer, scholar, or business leader. One open-hearted, fair, and just human being. Multiply that by the tens of thousands of graduates educated by Saint Mary’s. We owe our identity and existence to a bold idea—a revolutionary idea for the 17th century in which it was conceived—that education is not just the special privilege of an elite class, but a life-changing right of any person with the will and the promise to rise above impediments to learn and succeed. The mission of the Christian Brothers calls us to provide an accessible education, uniquely crafted of the highest quality and made possible through the support of student scholarships, investment in academic excellence, and through funding opportunities as they arise. The Campaign for Saint Mary’s will define our future and, more importantly, define the lives of our students by ensuring that Lasallian intellectual, spiritual, and social values are always part of this exceptional university education. Our vision to be the leading Catholic comprehensive university in the western United States—by virtue of an academic enterprise built on our core traditions and focused on graduation outcomes—requires additional investment to fully realize its potential. Your philanthropic support will define the future of Saint Mary’s College for our students and the millions of lives they touch. “We are poised for greatness. We imagine a future with limitless possibility, where students find their voices and embody the mission of the College throughout their lives." and ensure our financial position is strong for current students and sustained for generations to come. The affordability of a Saint Mary’s education is a profound and real consideration for our students and their families, as an extraordinary university education should be. Our ability to provide competitive financial and merit-based scholarship support, ensuring that all students can pursue commencement at Saint Mary’s, is a tremendous opportunity. Guided by the values empowered by our Catholic faith and the legacy of the Christian Brothers, we will increase our student scholarship investment by $30M. Saint Mary’s challenges students to fully realize their best selves—mind, body, heart, and soul. Central to this journey is the distinct relationship between a Saint Mary’s student and a member of our accomplished faculty. Collaborative opportunities between students and faculty are essential for our academic enterprise to inform a more just and sustainable world, built upon promoting global perspectives and inclusive excellence. Endowing and investing more than $24M in academic excellence, including funding for a new Library & Learning Commons at Saint Mary’s, will help attract the best faculty scholars, who will teach with the facilities, tools, and resources necessary to prepare our students for meaningful personal and professional lives. Who we are, what we become, and how we travel through life depend upon the depth and care in which we conduct our conversations to explore our humanity and spirituality. The Catholic Institute of Lasallian Social Action (CILSA) promotes a culture of service, engaged learning, and social justice education at Saint Mary’s. This is the spirit in which we propose to increase student and faculty immersion experiences and partnerships with community organizations, in addition to creating rich opportunities to nurture mind and spirit through life-defining work with $2M in support. By strengthening the Lasallian Catholic mission, we will deepen the College’s impact on the faith lives of Saint Mary’s students, provide valuable service-learning opportunities where faculty and students collaborate on real-world solutions, and expand the College’s reach with service in our regional and global communities. We are an institution called to embrace innovation and opportunity when it presents itself. We are nimble in stature, which serves as a robust asset for adapting to students' needs while also remaining true to our core. To be able to quickly capitalize on new opportunities requires resources. 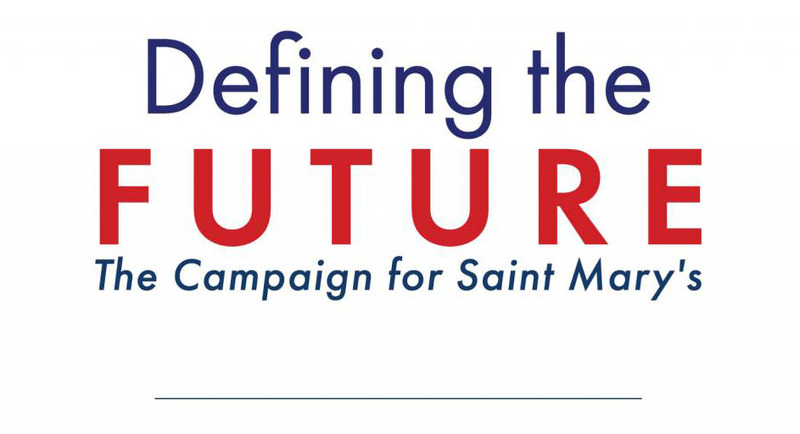 Defining the Future: The Campaign for Saint Mary’s invites alumni, parents, and friends to fund unrestricted support. Here's what we have accomplished so far. "This bold campaign will set us apart in the highly competitive higher education landscape by supporting the distinctive values of a Saint Mary’s education."